Background: Backpack weight might leads to several musculoskeletal disorders there by it affects normal posture as well, to those carrying it, especially school children’s and porters, etc. Objective: To find out the effect of backpack weight on cervical angle in school going children. Design: Cross sectional study. Participants: 200 normal healthy individuals between 9 to 14 years of males and females, not using vehicles were included in the study from Bhagwan Mahaveer Public School, Ajmer, and Rajasthan. Measurements: The height in centimetres and weight in kilograms was measured using stadiometer and weighing machine respectively. The difference in weight of individual with the backpack and without the backpack weight was calculated and considered as their backpack weight. Cervical angle was also measured using inclinometer, by fixing it exactly above the ear, by making its needle to direct the centre point of the external ear. The calibrated inclinometer was held at zero in order to avoid head flexion/extension during these movements. Results: The demographic data of all the subjects who participated in the study, the mean Age, Height and Weight were 11.93 years, 139.67 cm and 36.53 kg, respectively. And the cervical angle measured without bag was 3.1 ± 0.62 and that taken with bag was 5.6 ± 1.17. And the study shows significant difference between without and with bag students p 0.000 (p<0.05). Conclusion: From the results of this study it can be concluded that there was a change in the cervical angle on carrying a backpack in school going children. In general school going children were carrying the school bags on their back, and it was consider to be best way to carry it, because equal weights was placed on both sides of the shoulder in order to maintain the stability of the body. But this in turn has an impact on the posture especially on the head, neck and trunk, by making children’s to consistently maintain forward lean posture which leads to discomfort to them . A backpack is, in its simplest form, a cloth sack carried on one’s back and secured with two straps that go over the shoulders. Backpack in the form load, distributed improperly or unevenly, indeed day after day causes stress to growing spinal column (Table 1). Usually, the pace of growth rate will be high during childhood and puberty, at the same by the age between 16-18 years of age, it will be stopped. But the vertebral ossification will be up to mid-twenties [2-5]. In longer duration, the vertebral column is more subjected to injuries, so providing or advising the appropriate schoolbag will be advised. Centre of gravity was shifted to the back, over the base of support, when the school children carrying their bags at their back, this will be compromised by bending the head forward or at the level of ankle and hip. But certain children has larger head circumference, so they have more mass at the T12 , this in turn has impact on their posture and leads to injury [4-6]. Musculoskeletal symptoms in school children are multifactorial in origin; the carriage of heavy school bag is one of the reasons for it . The combined effects of heavy load, position of the load on body, size and shape of the load, and load distribution, time spent carrying, physical characteristics and physical condition of the individual were hypothesized as factors which were associated with these problems. Many authors in the past have studied the effect of carrying load on different biomechanical and physiological parameters in adults. The effects of carrying load on posture, gait [8,9], muscle activity, lung function [10,11] and energy expenditure have been studied in adults and children. Backpack in children appears to be more common than was previously thought. Studies have indicated that 10%-30% of healthy children experience back pain, especially low back pain, by their teenage years [2,3]. Hence, investigating postural responses to load carrying will help us to understand the impact of school backpack on children. These alterations can lead to back pain and injury by stressing ligaments or muscles in the back or by changing the forces applied to the intervertebral discs. As the individuals fatigue and these changes become more pronounced, there is potential for the risk of injury to the load carrier. The studies done by other researchers proved that carrying backpack leads to “forward head position” . These changes in alignment of the neck can produce strain of cervical joints and soft tissue as well as imbalanced muscle performances. This can cause pain in cervical, upper thoracic and shoulder region . Hence, investigating the postural responses to load carrying will help us to understand the “the effect of backpack weight on cervical angle in school going children” [13-16]. To find out the effect of backpack weight on cervical angle in school going children (Table 2). Table 2: Showing the comparison of mean values of cervical angle (in degrees) without bag and with bag in the sample studied. Few Studies have focused on the effect of back pack weight on the postural angles in school going children. There is scarcity of information regarding the change in postural (cervical) angle of children in India. Thus, the present study was undertaken to find out the effect of back pack weight on cervical angle in school going children. There will be no significant effect of backpack weight on cervical angle in school going children. There will be a significant effect of backpack weight on cervical angle in school going children. Hundekari et al. demonstrated that the increased forward head posture observed in children while carrying loaded backpacks are associated with backpack weight . Chow et al. concluded that backpack when placed at a higher position may cause more deviation as compared to middle and lower position. No conclusion was made for load limit . Singh and Koh concluded that backpack weight above 15%of bodyweight should be avoided and recommended that higher position of backpack causes more deviation compared to lower position of backpack. Brackley et al. concluded that using backpack weight with 15%of bodyweight causes significant changes of total forward load and craniovertebral angle . M Ramprasad et al. concluded that carrying a backpack weighing 15% of body weight changes all the postural angles in preadolescent children . Sharifaalwiah Syed and Abd Rahman stated that carrying heavy load of 15% to 20% of body weight during level dynamic activities includes a significant increase in trunk inclination angle for children age 6 years . Haselgrove et al. Neck pain is as common as back pain amongst adolescents. Perceived schoolbag load, duration of carriage and method of transport to school are associated with back and neck pain. Physical activities in the form of walking or riding to school may offset the potentially provocative effects of prolonged back carriage and warrants further investigations. Lafond et al. Found a significant linear trend for increasing sagittal plane postural translations of the head, thorax, pelvis and knees was found as children aged from 4 years to 12 years. These postural translations provide preliminary normative data for the alignment of a child’s sagittal plane posture. Mayank et al. Found that carrying a backpack weighing 10% of the body weight appeared to be too heavy to maintain standing posture for adolescents. These findings have implications for future load carrying studies in adolescents . Talbott suggested that backpack weight above 20% of bodyweight should be avoided and recommended that the higher position may cause more deviation compared to lower position. Kvoy et al. Suggested that the study outlined the variability of relaxed upright standing posture of children aged 5-12 years, when measured twice in an hour. Age influenced the size of angles but not the variability. While the subject’s numbers in this study are small, the findings provide useful information on which further studies in posture and its development in pre-adolescent children can be based. Grimmer et al. Stated that there is evidence refuting ‘rule of thumb’ to carry the backpack high on the back. Typical school backpacks should be positioned at the centre of waist or hip level. There is no evidence for the 10% body weight limit . Goodgold suggested that the relationship between heavy backpack load and back pain needs further elucidation . Chansirinukor et al. Found that both backpack weight and time carried influenced cervical and shoulder posture . Riegal-morris et al. Suggested that the high incidence of postural abnormalities in TCS region in a group of healthy subjects between the age group of 20 and 50 years. Voll and Klimt found that carrying a backpack weighing 15% of body weight changes all the postural angles in pre-adolescent children . Two hundred normal healthy individuals between 9 to 14 years of males and females, not using vehicles were included in the study. Permission was obtained from the school principal and the class teacher of the respective classes and the study procedure was explained to the teacher. An informed consent was obtained from the parent of the participant. 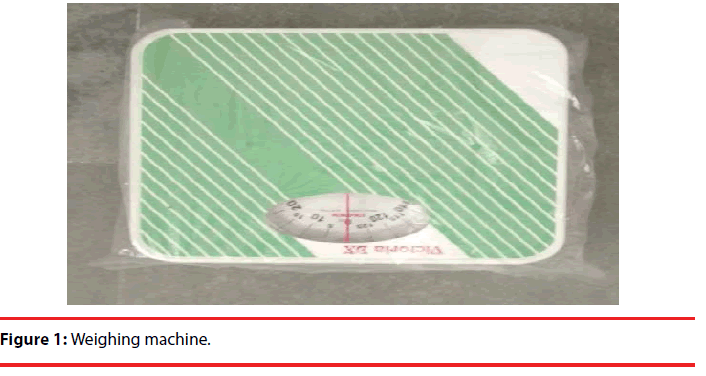 The height in centimetres and weight in kilograms was measured using stadiometer and weighing machine respectively (Figure 1). 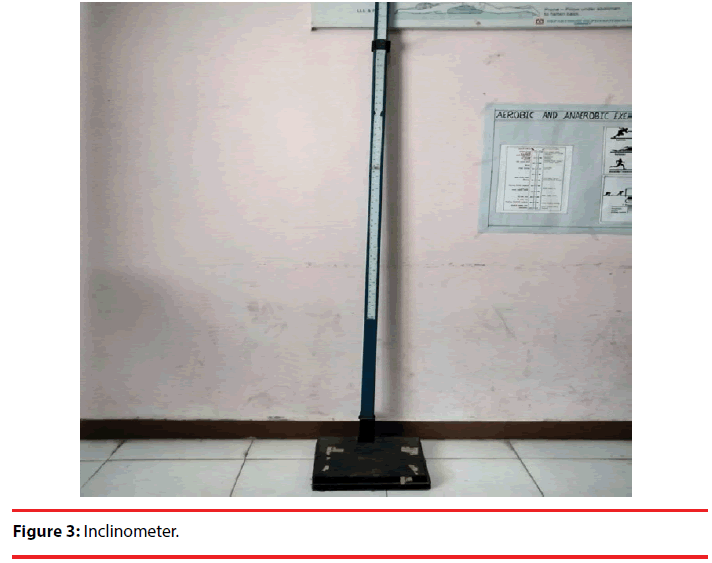 The subjects were instructed to remove the shoes and stand on a weighing machine and the weight was recorded for each individual, and their height was recorded by using stadiometer, the subjects were asked to stand near the stadiometer while maintaining an erect posture, the subject were then asked to wear their back pack and the weight was measured again (Figure 2). The difference in weight of individual with the backpack and without the backpack weight was calculated and considered as their backpack weight. The study was conducted in the games hour of each class, under the supervision of class incharge, and game teacher (Figure 3). The subject was requested to maintain a neutral head position, by instructing them to maintain a chin tuck in position and looking forwards with their spine straight and their ear to shoulder level was checked to make sure that the subject is maintaining a neutral head position, with the purpose of positioning the head’s center of mass in a vertical plane through the atlantooccipital joints with the nose pointing forward in line with the sternum and bellybutton. The inclinometer was placed above the right ear with its needle pointing vertically towards the centre of the external ear (Figure 4), the calibrated inclinometer was held at zero in order to avoid head flexion/extension during these movements . 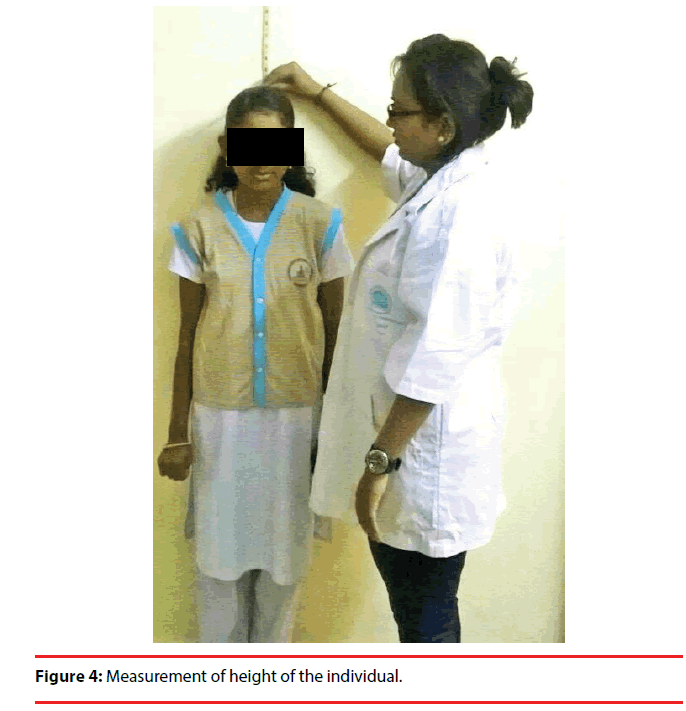 Figure 4: Measurement of height of the individual. The data collected was tabulated and analysed using SPSS version 17.Paired t’- test was used to compare the values of cervical angle measured in children without bag and with bag (Table 3). Table 3: Showing the analysis of comparison of cervical angle without bag and with bag in the sample studied. This study was done to see the effect of back pack weight on postural (cervical) angle in school going children. There was a change in the cervical angle when measured with and without bag. Thus, the results of this study showed that there is a statistically significant effect of back pack weight on postural angle of school going children (p<0.05) (Figure 5). Figure 5: Measurement of the weight of the individual. By studying the postural responses to loads, the impact of carrying school bags on children can be understood. When load is positioned posterior to the body in the form of backpack it changes posture because of changes to centre of gravity. The body tries to keep the centre of gravity between feet, so with a backpack, the trunk is in a more forward position, placing abnormal forces on the spine. Centre of gravity was shifted to the back, over the base of support, when the school children carrying their bags at their back, this will be compromised by bending the head forward or at the level of ankle and hip. But certain children has larger head circumference, so they have more mass at the T12 , this in turn has impact on their posture and leads to injury [4-6]. These alterations can lead to back pain and injury by stressing ligaments or muscles in the back or by changing the forces applied to the intervertebral discs. As the individuals fatigue and these changes become more pronounced, there is potential for the risk of injury to the load carrier. The studies have done by other researchers proved that carrying backpack lead to “forward head position” . These changes in alignment of the neck can produce strain of cervical joints and soft tissue as well as imbalanced muscle performances. This can cause pain in cervical, upper thoracic and shoulder region. The effect of back pack weight on the posture of school going children has been a topic of interest for various other authors in the past. There are researches to prove that back pack weight causes a change in postural angles of the body, namely craniovertebral angle, craniohorizontal angle. 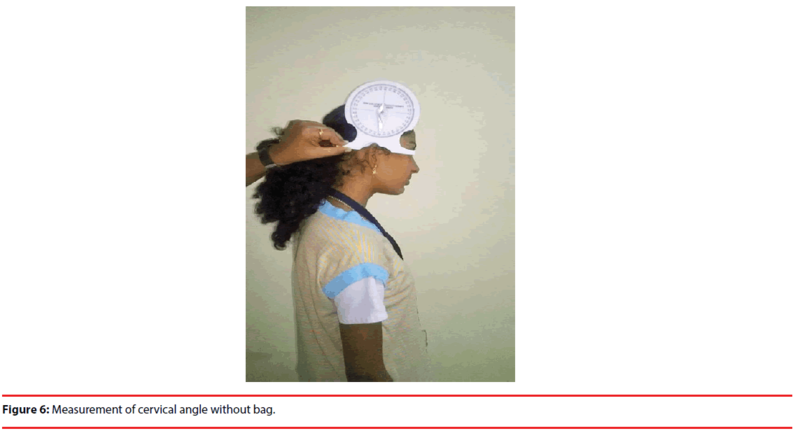 This study is by far the first one to measure the change in cervical angle due to backpack weight in school going children (Figure 6). 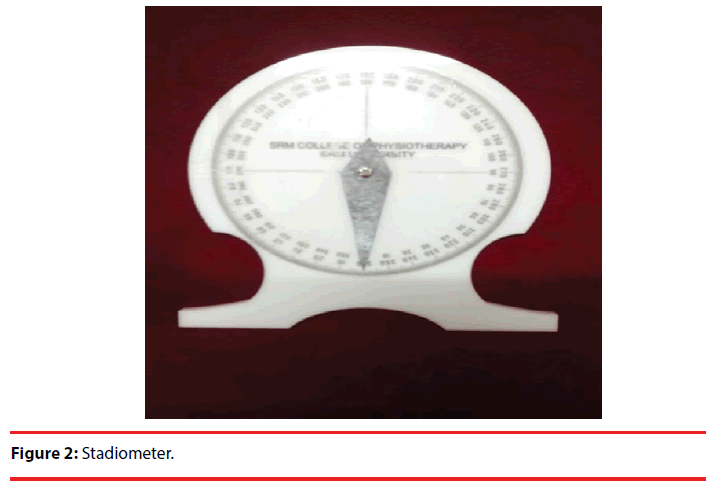 Figure 6: Measurement of cervical angle without bag. The results of this study are somewhat related to the findings of a study done by Ramprasad et al. which showed that the carrying back pack weighing 15% of body weight changes all postural angles in preadolescent children . Sharifaalwiah Syed and Rahman stated that carrying heavy load of 15% to 20% of body weight during level dynamic activities include a significant increase in trunk inclination angle for children age 6 years . Voll and Klimt found that carrying a backpack weighing 15% of body weight changes all the postural angles in pre-adolescent children. Lafond et al. in found a significant linear trend in age ranging from 4 to 12 years for increasing sagittal plane postural translations of the head, thorax, pelvis and knees, and it has been provided the baseline data for sagittal plane translational alignment of children [21-23]. Chansirinukor found adolescents were unable to maintain an upright standing posture when carrying more than 15% of body weight due to the imposed load . Grimmer compared adolescents carrying backpacks to unloaded standing and found that 3%, 5% and 10% of body weights were placed on high, low, centred over the back respectively, and among those, the one placed at the high has major impact on the back by forward postural shifting, when compared to the one which placed on the centre or low back . Lai found that cervical and shoulder postures were influenced by both amount and duration of weight carried by a backpack suggesting that back problems may occur from back pack weights greater than 10% . The results of this study found a significant increase in the cervical angle on carrying a backpack. But the effect of this increase in cervical angle on the overall posture of the child and its relation to forward head posture is yet to be identified. Hence, future researches should focus on this aspect. In this study, we have seen the effect of back pack weight only on the cervical angle and not on the other postural angles of the body like the trunk angle and the lower limb angle. Various other kinds of back packs with different load reduction systems may have a different effect on the postural angle of children. Hence, the findings of this study cannot be extrapolated to all kinds of school back packs. Since, repeated carrying of backpack leads to various postural problems like forward head posture, good carrying habits with better backpack design, like use of ergonomically designed backpacks for carrying weight, the best book bag for children is a two stripped bag (Figure 7). Secondly, when considering the appropriate bag for the school children, there should be not very large size compare to child’s back. And placed exactly down 1-2 inches from the shoulder and not reaching beyond the waist line up to 4 inches, and when it comes to straps and padding it should be wider, because it distributes the load throughout the shoulder area and padding will prevent the pressure on single points. A strap at the level waist will helpful to minimize the pressure from shoulder to other areas like waist and hip muscles, thereby it reduces stress on the spine. Chest straps which connects both the shoulder straps which avoids the weight slippage and shifting of the shoulders and it also makes the child to move comfortably without any compromising movements, so the bag should light weighted, because the stress on the spine is directly proportional to it. So, limiting the weight of backpack is recommended to reduce the immediate and chronic postural changes . 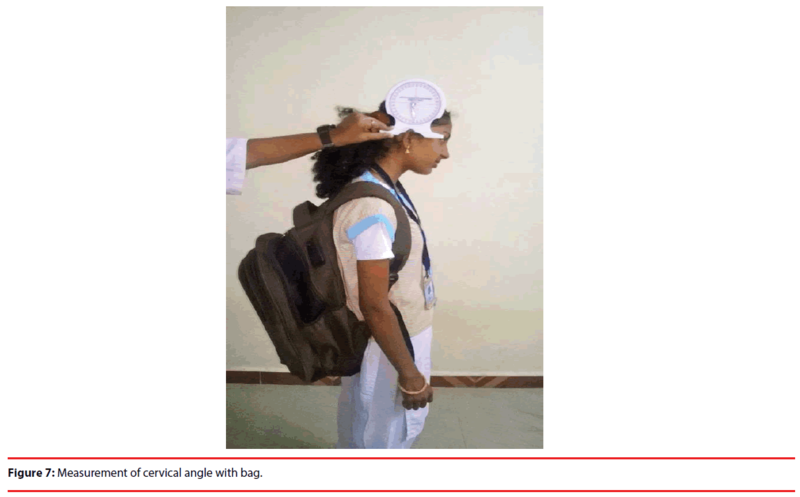 Figure 7: Measurement of cervical angle with bag. This study focused on the effects of backpack weight on cervical angle, and concluded that there is change in cervical angle on carrying a backpack. Unequal distribution of male and female participants (Graph 1). 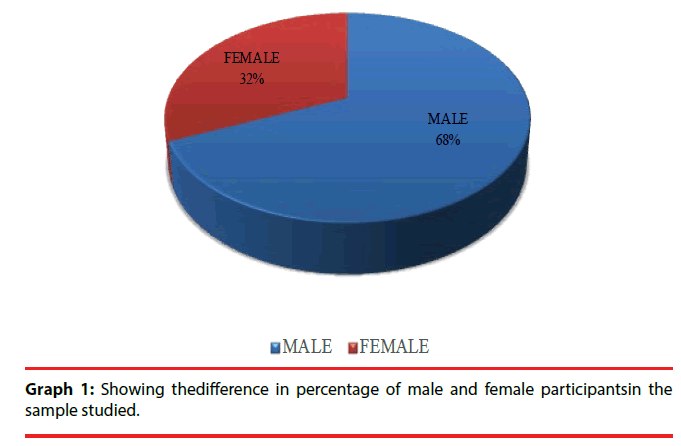 Graph 1: Showing thedifference in percentage of male and female participantsin the sample studied. Future studies can be done with a large sample size (Graph 2). 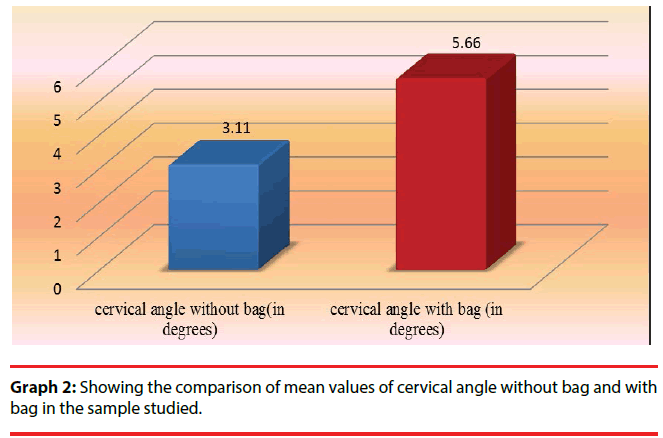 Graph 2: Showing the comparison of mean values of cervical angle without bag and with bag in the sample studied. In future studies changes in other postural angles can be analysed. Postural response to load following dynamic activities and during dynamic conditions can be studied. In future studies software analysis of the postural angles using image tools can be done. Equal number of male and female subjects can be studied to remove the gender bias. Voll HJ, Klimt F. Constrain in children caused by carrying schoolbags, (Diebeanspruchung des kindes durch die schultasche: translated by Theodridis D). Offentliche. Gesundheitswesen 39(1),369-378 (1977). Grimmer K, Dansie B, Milanse S, et al. Adolescent standing postural response to backpack loads: A randomized controlled experimental study. BMC. Musculoskelet. Disord 3,10 (2002). Mayank M, Upendar S, Nishant Q. Effect of backpack loading on cervical and shoulder posture in Indian school children. Indian. J. Physiother. Occup. Ther 1,3-12 (2006). Lanes TC, Gauron EF, Spratt KF, et al. Long term follow up of patients with low back pain treated in a multidisciplinary rehabilitation program Spine (Phila Pa 1976) 20(7),801-806 (1995). Shumway CA. Control of normal mobility. In: Shumway CA, Woollacott MH, Eds. Motor Control: Theory and Practical Applications Maryland USA: Lippincott Williams and Wilkins 22,2128-2156 (2001). Tulder M, Koes B. Conservative treatment of acute and chronic nonspecific low back pain. Spine 22,128-234 (1997). Whittfield JK, Legg SJ, Hedderley DI. The weight and use of schoolbags in New Zealand secondary schools. Ergonomics 44(9),819-824 (2001). Murray MP, Kory RC, Clarkson BH, et al. Comparison of free and fast walking patterns of normal men. Am. J. Phys. Med 45(1),8-23 (1966). Kinoshita H. Effect of different loads and carrying systems on selected biomechanical parameters describing walking gait. Ergonomics 28(9),1347-1362 (1985). Legg SJ. Effect of single and double strap backpacks on lung function. Ergonomics 47(3),318-323 (2004). Lai JP, Jones AY. The effect of shoulder- girdle loading by a school bag lung volumes in Chinese primary school children. Early. Hum. Dev 62(1),79-86 (2001). Chansirinukor W, Wilson D, Grimmer K, et al. Effects of backpacks on students: Measurement of cervical and shoulder posture. Aust. J. Physiother 47(2),110-116 (2001). Severinsson Y, Elisson L, Bunketorp O. Reliability of measuring the cervical sagittal translation mobility with a simple method in a clinical setting. Rehabil. Res. Pract 629104 Epub 2012 Nov 4 (2012). Abdul Rahman SAS, Rambely AS. Effects of varying backpack loads on trunk inclination during level walking (2009). Goodgold S, Mohr K, Samant A, et al. Effects of backpack load and task demand on trunk forward lean (2002). Hundekari J, Chilwant K, Vedpathak C, et al. Does alteration in backpack load affects posture of school children? 7,71-75 (2013). Brackley HM, Stevenson JM, Selinger JC. To examine the effect of backpack load placement on posture and spinal curvature in prepubescent children. Work32(3),351-360 (2009). Chow DHK, Zou ZY, Wang XG, et al. To investigate the effects of different backpack placements on spinal deformation and repositioning error in school going children. Ergonomics 21(1),2148-2156 (2010). Devroey C, Jonkers I, de Becker A, et al. Evaluation of the effect of backpack load and position during standing and walking using biomechanical, physiological and subjective measures. Ergonomics 50(5),728-742. Ramprasad M, Alias J, Raghuveer AK. Effects of backpack weight on postural angles in school going children. Indian. Pediatrics 47(23),14-17 (2009). Brackley HM, Stevenson JM, Selinger JC. Effect of backpack load placement on posture and spinal curvature in prepubescent children. Work 32(3),351-360 (2009). Chow DH, Ou ZY, Wang XG. Short-term effects of backpack load placement on spine deformation and repositioning error in school children. Ergonomics 53 (1),56-64 (2010). Devroey C, Jonkers I, de Becker A. (2007) Evaluation of the effect of backpack load and position during standing and walking using biomechanical .physiological and subjective measures. Ergonomics 50(5),728-734.